Are you the kind of person who gets motivated or un-motivated after a vacation? I'm a big believer in taking vacations as early and often as possible in order to avoid burnout and maintain a healthy well-being. These days, however, I've been coming back from my vacations itching for more and not feeling the least bit restored. I've noticed that this has been a trend in the past few years — I blame social media and how it's made unplugging from the blog a near impossibility. So even though we've had a few long weekends and I've taken days off here and there, I'm still feeling a little burned out from it all. On my first day back from my non-vacation of a vacation, I made these donuts in an attempt to get back into the groove of baking. Although I started out the process begrudgingly, my spirits had lifted considerably by the time I pulled out the first batch from the oven. 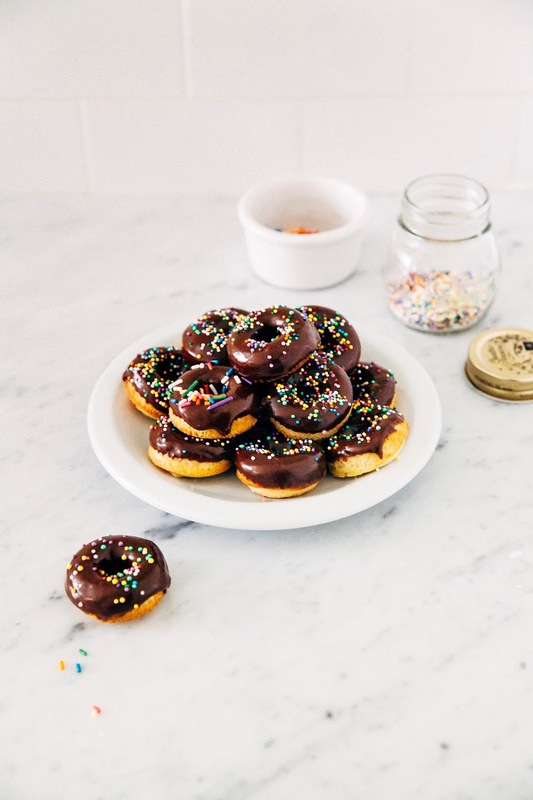 Because mini donuts — who can resist them? 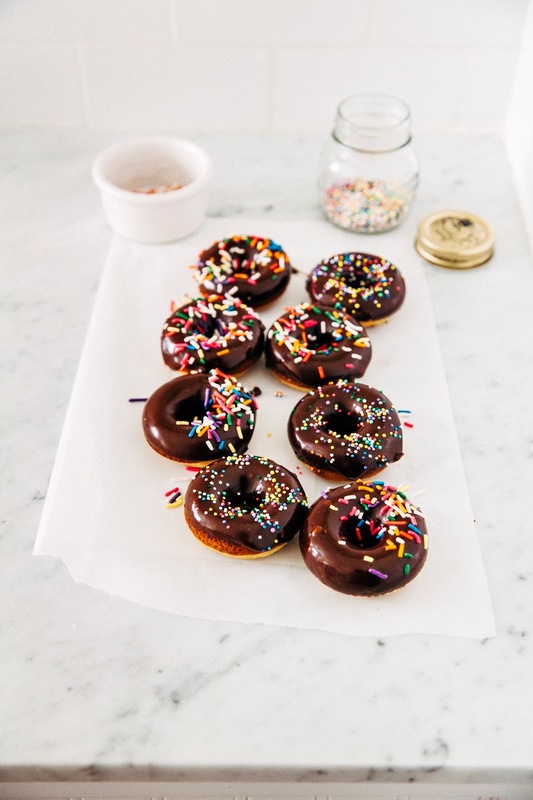 Especially when studded with sprinkles and glazed with shiny chocolate. They literally seem like cheer in the palm of your hand! 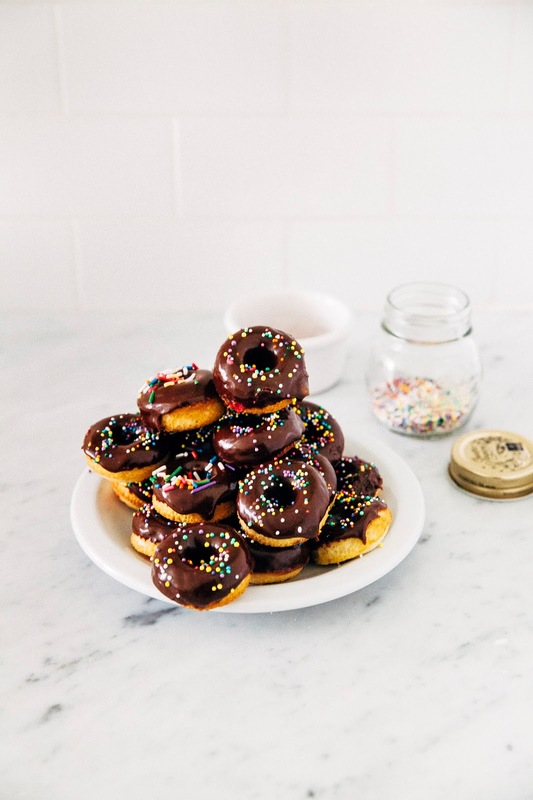 These mini donuts come from Williams-Sonoma's new (also mini) cookbook, The Doughnut Cookbook. 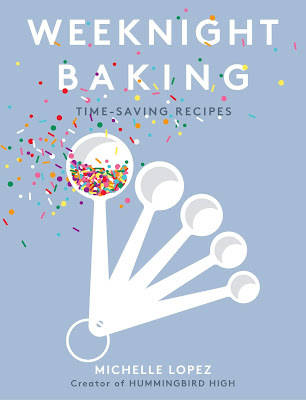 Small and mighty, it guides you through a variety of donut recipes that range from the basic yeast variety to more exciting baked flavor bases like carrot cake and these funfetti donuts. Even though baked donuts don't get as much love as the fried kind, I've always had a soft spot for them as they come together much more easily and are just as tasty. 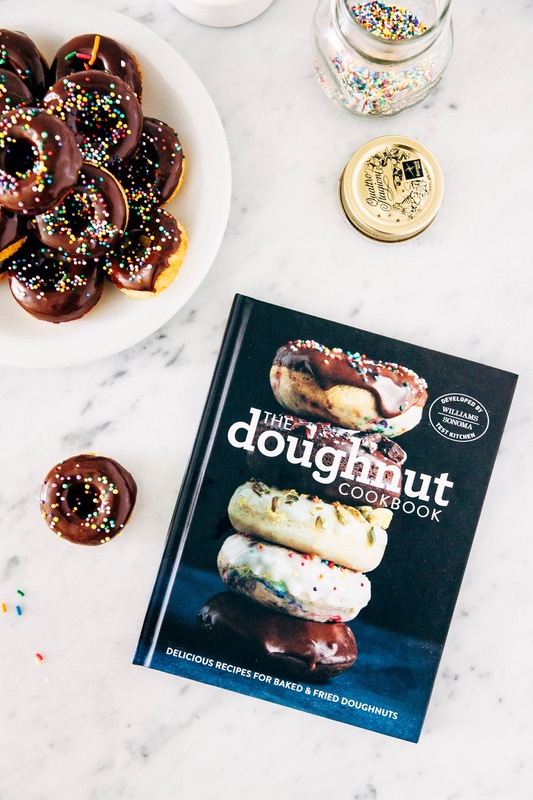 Thanks Williams-Sonoma for sponsoring this post by graciously providing The Doughnut Cookbook and other equipment for my new Brooklyn kitchen to help me bake and cook. All thoughts and opinions are my own; thank you for supporting Hummingbird High and all my sponsors! 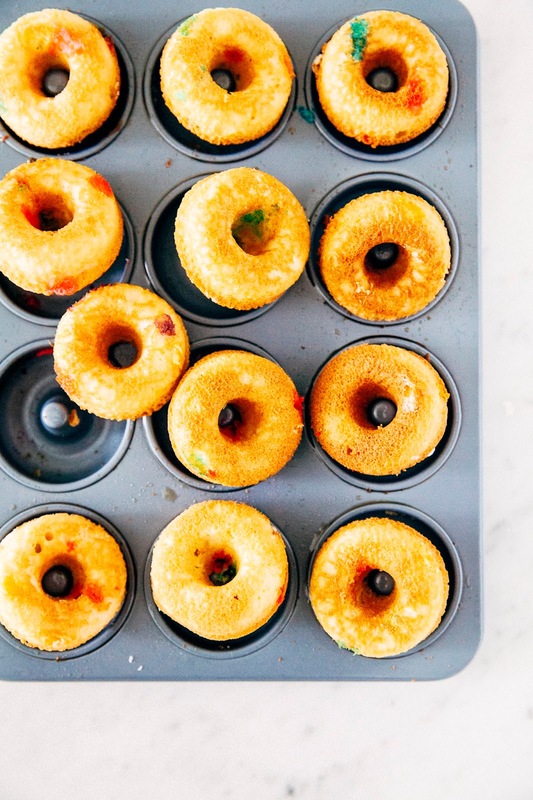 I used this mini donut pan to bake my donuts, but you can also use a regular sized pan for the same recipe without needing to adjust the baking time. Be sure to use a lot of cooking spray in the donut cavities so that the donuts pop out with ease! 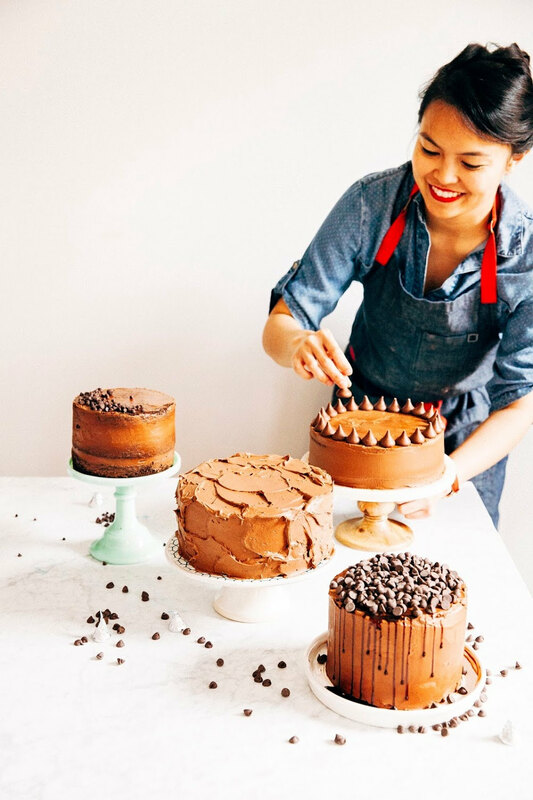 Be sure to use the glaze IMMEDIATELY after making — it tends to harden quickly! 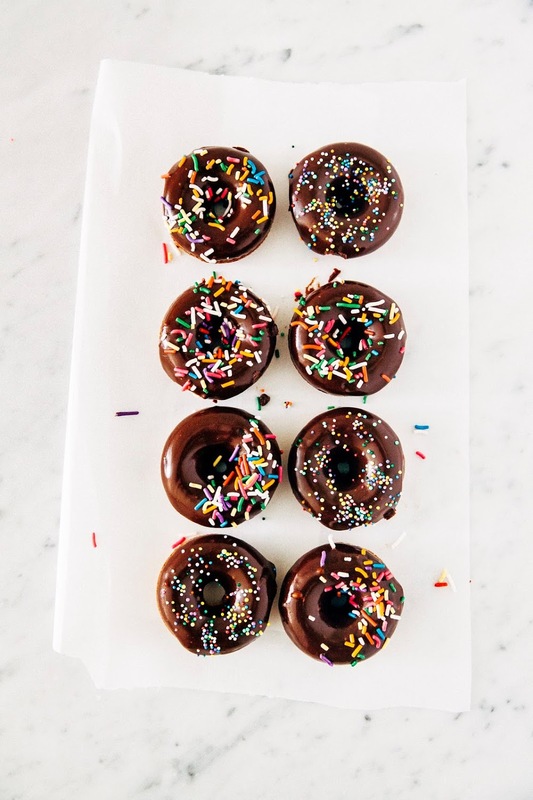 If you like taking your time decorating, it helps to keep the chocolate glaze over a very, very low heat to prevent it from hardening while you decorate the donuts. Stir every minute or so to prevent the top from glazing. Center a rack in the oven and preheat to 375 (F). Coat the wells of a donut pan generously with cooking spray, making sure to get the indent in the center of each cavity as well. Set aside. In a medium bowl, whisk together 1 1/2 cups all-purpose flour, 3/4 teaspoon baking powder, 1/4 teaspoon baking soda, and 1/4 teaspoon kosher salt. In a liquid measuring cup, stir together 1/3 cup buttermilk and 1/3 cup whole milk. Set aside. In the bowl of a freestanding electric mixer fitted with a paddle attachment, beat 6 tablespoons unsalted butter and 1/2 cup sugar on medium speed until light and fluffy, about 2 minutes. Scrape down the sides of the bowl. Add 1 large egg and 2 teaspoons pure vanilla extract; beat on medium speed until well combined about 1 minute. On low speed, add the flour mixture (from the 2nd step) in 3 additions, alternating with the milk mixture (also from the 2nd step) and beginning and ending with the flour. Beat each addition just until the ingredients have combined. Fold in 3 tablespoons rainbow sprinkles. Pour the batter into a piping bag (see baker's notes) and use the piping bag to add about 2 tablespoons of batter to each cavity in the donut pan. There's no need to be precise here — just add enough batter until each cavity is about 2/3rds of the way full. DO NOT OVERFILL, or your donuts won't come out shaped like donuts. Transfer to the preheated oven and bake until a toothpick inserted into each donut comes out clean, about 10 minutes. Let cool in the pan on a wire rack for 5 minutes, then invert the donuts onto the rack to cool completely. Meanwhile, wash and dry the pan and repeat the steps above to bake the remaining batter. Make a double boiler by filling a small saucepan with water and placing a medium, heatproof bowl over the pan — make sure that the bottom of the bowl does not touch the water. Bring the water to a gentle simmer over low heat. In the bowl, combine 2 cups confectioners' sugar, 4 ounces semisweet chocolate, 5 tablespoons unsalted butter, 1/4 cup water, 1 1/2 teaspoons pure vanilla extract, and 1/4 teaspoon kosher salt. Cook, stirring occasionally, until the chocolate and butter are completely melted, around 2 to 3 minutes. Remove from heat and stir until smooth and well blended, and use immediately. Line a baking sheet with parchment paper. Dip the donuts, top side down, into the glaze. 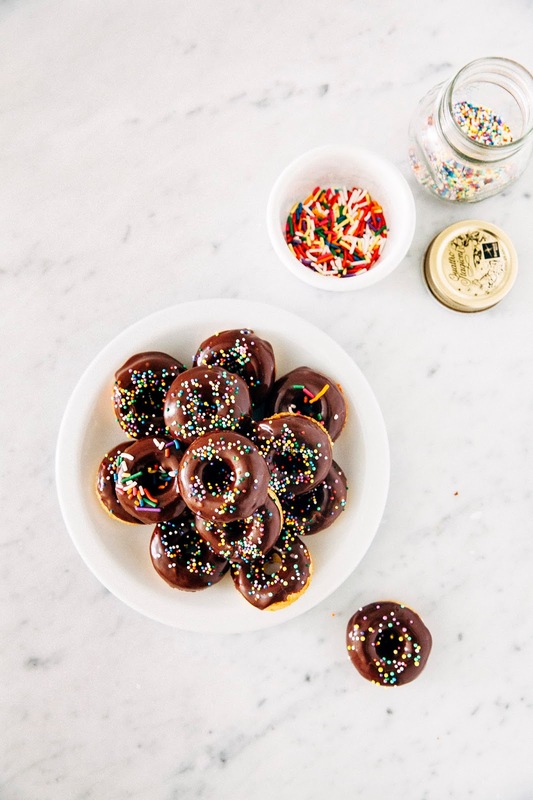 Place on the prepared baking sheet with the glazed side up, and immediately decorate with jimmies and nonpareils sprinkles. The donuts are best the day they're made. Enjoy!